Killer Joe took the Sydney Film Festival by storm on the second night; shocking, thrilling and entertaining its audience in equal measure. I didn't get the chance to see William Friedkin's controversial new film until the second half of the festival, immediately following Holy Motors (a tough act to follow). It lived up to the hype and proved to be a crazy, brutal and often-hilarious tale featuring murder, Texas redneck stupidity and Matthew McConaughey awesomeness. Its been five years since Friedkin directed his most recent feature, Bug, a collaboration with playwright Tracy Letts, who adapted his own material into a screenplay for Bug and Killer Joe. Highly anticipated, it is quite a bold project for the 76-year-old director, famous for his genre-defining classics from the 70's, The French Connection and The Exorcist. Chris Smith (Emile Hirsch) is a local drug dealer in deep trouble. Needing money to pay back a debt, he brings to his father Ansel (Thomas Haden Church) a plan that could solve all of their problems. It involves killing Chris' mother and Ansel's ex-wife - he's married to Sharla (Gina Gershon) now - for a large chunk of insurance money that he has on good authority has been left entirely to his younger sister Dottie (Juno Temple). To realise the plan they look to hire Joe Cooper (Matthew McConaughey), a detective with a side-business, but when they are unable to pay for his services upfront (requiring the insurance money to pay him) he looks to take a retainer: freedom to seduce Dottie. Plans go awry, and Joe will stop at nothing to see Chris' family repay their debt to him. 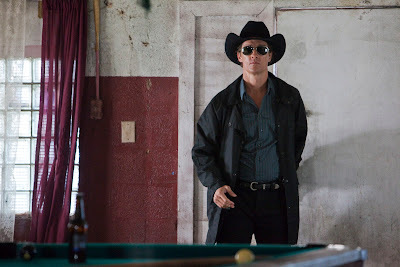 Killer Joe has a pulpy 70s feel to it. It is somewhat Tarantino-esque in the way that comedy and savage (and on a few occasions very excessive) violence run hand-in-hand. The film is very funny, but in dealing with a very inappropriate sexual relationship, drug-dealing, unforgiving crime lords and no-nonsense hitmen, it is full of unsavoury menace too. This is a coarse and mean-spirited film at times. A lot of the film is set within Ansel's trailer home, and it is a toxic environment. We are thrown into the life of this family of lowlives and ultimately find ourselves feeling sympathy for them when the calculated and highly intelligent Joe eats their idiocy up for breakfast, using his skills as a detective to take advantage of their ineptitude, double-crossing and flat out bad luck. The characters, with the exception of the Joe who sport sharp duds - black gloves, black silk shirts, and a black leather jacket - are vile and quite despicable. It is hard to believe that Matthew McCounaughey, who spent close to a decade taking his shirt off in terrible romantic comedies, was capable of completely embodying a character as nasty as Joe Cooper, giving a mesmerising, tour-de-force performance that ranks as one of the best I saw at the festival, and likely this year. He has always had the suave charm, but who knew he could provoke such fear in an audience. He is electrifying whenever he is on screen. Rounding out the cast are some impressive supporting performances. Emile Hirsch is a fine young actor, and he is convincing as the useless low-life drug dealer facing the heat on all sides, even sacrificing the innocence and well-being of his sister (whom he adores) to save his own skin. He is the guy we hope doesn't make it. Juno Temple is also a luminous young star going places. Gina Gershon has a memorable entrance, but will forever be remembered for a different scene altogether. She is perfectly cast as the white trash wife of the scene-stealing and endlessly watchable Haden Church, who gives any film a lift. 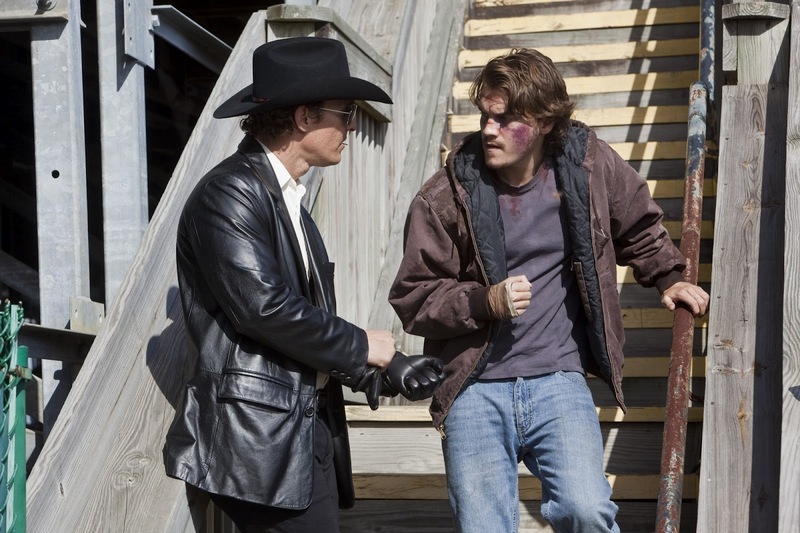 As clever and cool as Killer Joe is, there are some flaws that bring it down a point or two. On one occasion when Emile Hirsch's character is beaten up, there are some kicks that quite obviously don't land. Godfather-style. It also seems to be a little uncertain as to whose story we are following. Is it Chris' or Joe's? It is established as Chris' but because Joe is by far the most interesting and entertaining character, he becomes the primary focus in the second half. Joe is the titular character in the play, but Hirsch's absence for two of the film's key sequences is noticeable, however. Friedkin has painted a macabre tapestry of ugliness and debauchery here, and everyone comes off second best. The dialogue is electrifyingly brilliant, and despite being tough-going at times - the entire final 30 minutes is difficult to watch - it remains very entertaining. Friedkin is responsible for bringing one of the great horror stories to the screen, and he has shifted into equally dark territory here. Perverted yes, but a satisfying and memorable cinematic feast. Christ I want to see this badly. Gonna wait to read your review until it comes stateside! I've heard so many things about this one, so many good things, that is! I hope to see it soon!